Click to add a new SAP-Scale Service manually. 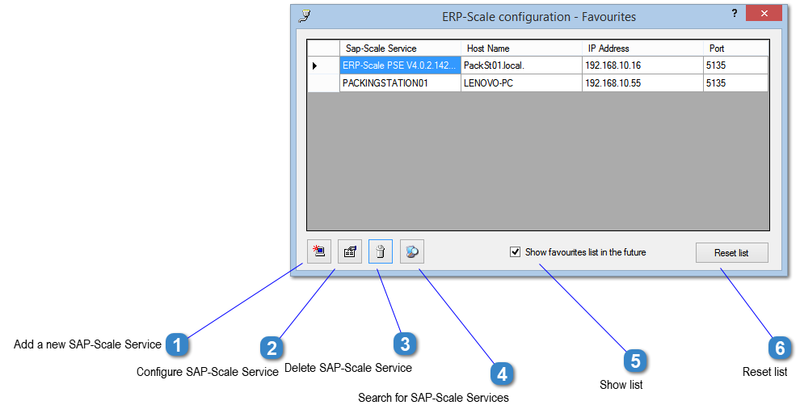 Click to open the ERP-Scale configuration utility for the SAP-Scale Service. Deletes the SAP-Scale Service from this list. Does not uninstall ERP-Scale or delete the ERP-Scale settings. Displays a list of SAP-Scale Services on your network. Uses Zeroconf for service advertising. Click to add the SAP-Scale Service to the Service list. Click to connect to the SAP-Scale Service without adding it to the Service list. Remove the tick from this box if you do not wish to display this list in the future. Also see the menu option Service>Show SAP-Scale Service favourites list at program start in the ERP-Scale configuration utility. 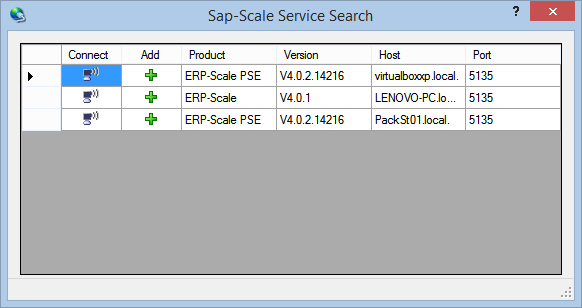 Remove all SAP-Scale Services from the list and add the default entry for the local PC.